It comes in the soul-rending blackness of night - eager for the sweet taste of fresh, innocent psyches who live unknowing in the bright forgiving daylight. Unaware of clotting truths that infect the less-tangable voids that nestle alongside our own world. Surrounded by empty form, eyes that glow blood-red linger in a state of forever within the darkness reserved for our most secret, anguished nightmares. Yes that's right! Conspiracy Journal is here once again to fill your minds with all the news and info that THEY don't want you to hear. THEY ARE BELIEVED BY MANY TO BE THE AGENTS OF THE “DARK GODS!” – THEIR MASSIVE WINGS, WHEN SPREAD FANLIKE, ARE KNOWN TO CAST A PARALYZING SHADOW OVER THE LAND! THEY EXIST ALONGSIDE US IN THE “REAL WORLD,” YET WE KNOW NEXT TO NOTHING ABOUT THEM! THEY APPEAR TO INHABIT PHYSICAL BODIES, BUT THEY COULD BE ARRIVING FROM OTHER DIMENSIONS OR THE MULTI UNIVERSE THROUGH “WINDOW” AREAS OR PORTALS! 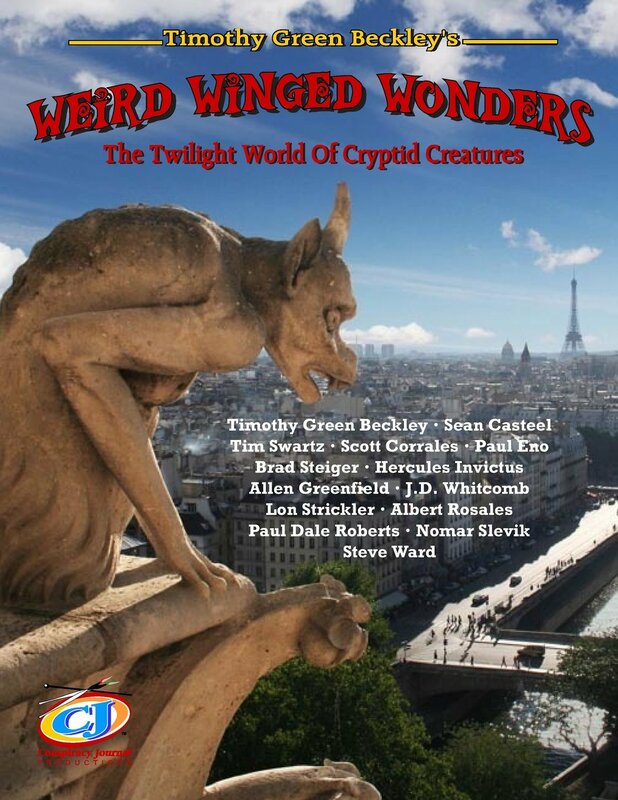 They are the winged wonders from the Twilight World of Cryptid creatures. *They are the Flying Felines of the Egyptian dynasties to the Greek Heroes living in underground caverns on Mount Olympus. *Here is the Mothman Creature, initially seen around the hamlet of Point Pleasant, West Virginia, and associated with the collapse there of the Silver Bridge – but now recently observed by dozens of credible witnesses in downtown Chicago. Some researchers say Mothman is a harbinger of death. *The Jersey Devil is said to be a demon who flies near the Pine Barrens mainly in the dead of night, while the Thunderbirds are massive creatures with wingspans of more than 30 feet. *Dragons are thought of as beings rooted firmly in mythology and the stuff of movies such as “The Hobbit” and popular cable TV shows such as “Game of Thrones.” Yet sightings of these aerial demons known to spit fire have been seen worldwide and are part of every culture – past and present – from Europe to the United States, and every continent in between. *Even more eerie are the flying and floating “alien” humanoids and witchy “brohaus” observed widely in Mexico and South America. 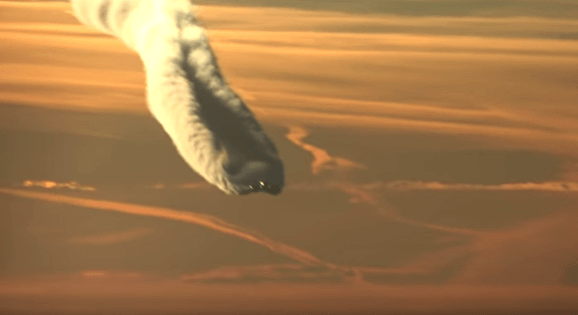 Here are dozens of the creepy-crawly narrations – backed up by the strangest of photographed evidence – of bizarre and unknown flying cryptids who frolic in our sky as if they have not a care in the world. Theories abound as to their origin(s) and nature and their overall grip on our perceived reality, as explored in this dramatic work by such respected researchers as Sean Casteel, Brad Steiger, Paul Eno, Allen Greenfield, Lon Strickler, Tim Swartz, Scott Corrales, Hercules Invictus, Jonathon David Whitcomb, Albert Rosales, Paul Dale Roberts, Steve Ward, Nomar Slevik, with the added editorial flare of “Exploring the Bizarre” co-host Tim Beckley. Are they demons straight from hell or from an unknown shadow world? Ultra-terrestrials who have strayed into “our territory” from another time and space continuum? Or simply prehistoric monsters thought to have died out millions of years ago, but who still exist living just beyond our reach, ready to be rediscovered by science? Whatever they are, they are truly BIZARRE! today for only $16.95 plus $5.00 for shipping - A GREAT PRICE! Art Bell, the ‘voice of the paranormal’ during the 1990s, has passed away at his home at age 72, according to the Nye County Sheriff’s Office. As host of the late night radio show Coast to Coast AM, syndicated on around 500 stations across America, Bell influenced a generation of paranormal enthusiasts. Born in Jacksonville, North Carolina, on June 17, 1945, Bell’s interest in radio manifested early – by the age of 13 he had become a licensed amateur radio operator, and throughout his life he worked both behind the microphone, as an engineer, and in front of it, as a DJ and show host. He had both the technical skills required for the former job, and the deep baritone and conversational skills that were a perfect fit for the latter. In 1986 he took on a five-hour time slot in the middle of the night at KDWN in Las Vegas. During the 1990s his show’s popularity grew substantially and became syndicated by hundreds of stations across the country, with up to 15 million listeners tuning in nightly to catch Bell talking about ‘fringe’ topics including the paranormal and conspiracies. The show’s popularity meant he was able to interview guests ranging from little-known paranormal researchers through to stars of music and film. Additionally, Bell’s Coast to Coast AM took unscreened calls and communication from listeners, resulting in plenty of awkward and unsettling moments. Some of these moments have become part of pop culture, from the introduction of ‘time traveler’ John Titor through to a hysterical alleged Area 51 employee (later used in a track by the band Tool). Given the weird and controversial topics covered by Coast to Coast AM, the show was not without controversy. Perhaps the most notable criticism of Bell came after the suicide of 39 members of the Heaven’s Gate cult, who believed that Comet Hale-Bopp was being trailed by a UFO; this had been a topic of discussion on Coast to Coast AM. Bell ‘retired’ from the show multiple times, for various reasons, from 1998 onwards, and continued hosting paranormal-themed radio shows until his passing. He will be remembered well by a generation of people who loved listening in to his late-night discussions of the weird and uncanny. Elon Musk Warns Against "AI Dictator"
Il’fat and Alsina Musin are newlyweds living in the town of Nizhnekamsk, a city in the Republic of Tatarstan, Russia. The family appealed to local journalists after they tried to endure the harassment by aggressive supernatural forces. The young couple claim that wherever they live (and they have to constantly move to different apartments), there is a bizarre fire that appears as if from nowhere. Il’fat and Alsina have been forced to move three times because of the strange fires. One fire was so fierce that the couple lost all of their belongings. Shortly after moving to their fourth apartment, they were horified to see a wall outlet suddenly start throwing off electic sparks and smoke. Not even their car has been spared by the supernatual flames as it caught fire while parked and burned in a matter of minutes. The couple are convinced that they are pursued by ill fate and fear for her little son. Every two to four days something strange takes place. The wiring in the apartment has been checked, but no apparent problems have been found. The couple are forced to sleep in shifts to keep an eye on things because a fire can flare up suddenly and for no apparent reason. The couple have no idea why this is happening to them. They say they attend mosque and pray, yet their problems persist. They assume that they could possibly be cursed...but again, they don't know why. Their neigbors have starting refering to them as“Eternal victims”. There have been similar cases of families haunted by paranormal fires. In 2015 a family in Malaysia was terrorised by mysterious fires and voices on a daily basis. “It is like whatever is causing the problem has moved into our home instead,” said Norzilawati Hassan. She said the entire family was now forced to live in the hall as most other parts of their homes were destroyed by fires. “We also hear voices and have even seen plates being thrown at us. Once, while I was sleeping, I was splashed with water from the aquarium until I was drenched,” she had said. A local reporter who went to interview the family had personally witnessed a piece of clothing hanging on the bathroom wall bursting into flames. Another case occurred in 1932, in the town of Bladenboro, North Carolina, where Council H. Williamson and his wife Lydia were terrorized by an outbreak of persistent, mysterious fires around their home. The first such incident was when a curtain and window shade in the dining room suddenly and inexplicably burst into flame, despite no source of fire being in the vicinity. Oddly, the flames were reported as having a bluish hue, and were reportedly unable to be put out by any normal means. They simply burned away until the curtains were ash, and then flickered out on their own. Numerous other fires broke out around the house, including a pair of pants that were hanging up to dry after being washed. Shortly thereafter, several witnesses saw a bed suddenly engulfed in flames. Perhaps the most frightening incident was when Mrs. Williamson’s cotton dress suddenly caught fire for no discernable reason. Her daughter and husband managed to rip the flaming clothes from her, and oddly enough, she suffered no burns from her frightening ordeal. In total, 20 such fires supposedly occurred over a three day period. In the latest case of weird Amazon Alexa stories, it’s been reported that friendly robot holds some views that aren’t, shall we say, accepted by the mainstream. Previously, the Amazon Echo Dot Alexa made headlines when it was creepily laughing at some of its owners. Now it seems like Alexa may be the worlds first AI conspiracy theorist. When asked “Alexa, what are chemtrails?” Amazon’s “intelligent personal assistant” responded by informing the unwitting user that chemtrails are nefarious chemical or biological agents sprayed into the atmosphere by the government. It seems somehow doubtful that Amazon programmed that little tidbit of information into their flagship smart-home intelligence. “Clandestine”…that’s a pretty heavy hitting word to bust out right there. Poor little speaker, it’s gone real deep down the rabbit hole. Now, forget for a minute your personal beliefs on chemtrails, however skeptical or conspiratorial your tendencies may be. Alexa’s not going to prove or disprove conspiracy theories. Not yet, anyway. The really strange thing about this case is how it could have happened, and what it means for the future of information and truth, now that we’re bringing increasingly more of these friendly little robo-helpers into our homes and our lives. Since this story broke, Amazon’s been quiet on how Alexa came up with this answer, saying it was a bug, and quickly announcing they had fixed it. Now, the Amazon Echo Dot Alexa gives the definition of “contrail” when asked what chemtrails are. Not surprising at all. Jeff Bezos would have some serious explaining to do if they decided to let Alexa keep its tin-foil hat on. This screw-up made news, how many don’t? There’s been many cases of Alexa just being flat-out wrong about simple information since the device was released, but through constant updates and machine-learning algorithms Alexa has gone from being unable to answer simple questions (as shown in this Reddit thread), to saying that chemtrails are a government conspiracy. As Alexa and other devices (like Google Home) get smarter, they’re going to try and answer more tough questions with simple answers dredged from the internet, or programmed with third party Alexa skills. Rolling in things like Alexa, one of the things that we’ve been learning is that it’s not even just necessarily about the facts. One of the big things we’re doing with Alexa is making sure that she has opinions. What does Alexa think is something that’s a good thing to watch? The most violent outbreaks of poltergeist were reported in England during 1977 to 1978. A shower of stones or pieces of bricks falls over the house all of a sudden. The windows are broken and things fly into the house. The doors bang as by themselves and strange noises come out of the walls and furniture. Things seem to be carried around by somebody invisible. Sometimes a strange shape seems to appear out of nothingness. You can even see water, blood, burning oil or other liquid gushing from walls or ceilings. Invisible creatures can leave marks on your clothing and inflict injuries on your body. If you happen to witness any of the above, please be advised that poltergeist is in the house. Vladislav Bukreev, a physicist from the Russian city of Voronezh, never doubted the existence of poltergeist. He says he spent all his life studying the unknown and mysterious including poltergeist, UFOs, ball lightning, magnetic fields, earth's internal energy etc. Mr. Bukreev says the people should look after the earth's physical and spiritual state. He asserts that numerous natural disasters are directly related to the poltergeist activity. He says the first poltergeist stories date back to the 16th century (poltergeist stands for "a noisy spirit" in German). The most violent outbreaks of poltergeist were reported in England during 1977 to 1978. A family in Enfield, a northern neighborhood of London, was driven to despair by the angry spirits. The bulky pieces of furniture were moved about the house. The teenage girls were lifted up and carried around in midair by some strange force. The Enfield phenomenon gave rise to another round of speculation about the link between the presence of children, especially girls, in a state of puberty, and the manifest signs of poltergeist. Researchers began to interpret poltergeist as an unusual display of sexually-charged mental tension. It was regarded as a safety valve for venting off energy. "However, at times poltergeist behaves quite well, I would say it develops a greater attachment to the people than to a place, and it should follow the people wherever they go," says Mr. Bukreev. The basis of a "noisy spirit" can be built of energy, physical, chemical, biological, and mental components, according to Mr. Bukreev. He believes that nature programmed the poltergeist into every human being. He also says that common nervous breakdowns and explosive mental states are also the poltergeist manifestations of a soul that is deeply distressed by grievous events of the outside world. Mr. Bukreev says we should take into account that the rules of poltergeist and rules of our world are opposites. Vladislav Bukreev is confident there is always a way to try and get rid of poltergeist or at least to keep it in check. He admits that it is hard to give any kind of advice since no human being can be aware of a particular occasion or circumstances leading to another energy resonance of things and events. "Using one's high spirits and benevolent attitude seems to be the only way to soften the effects of poltergeist," says Mr. Bukreev. Sometimes an exorcism or a prayer can help dispel the acts of poltergeist. And pets normally scare off the noisy spirits from the house. No cases of poltergeist were reported in the households with a cat or a dog. According to Mr. Bukreev, poltergeist is an active display of mental energy of those who are prone to showing strong emotion, and pets can effectively give comfort to such people and relieve the nerve strain. "Falling into despondency is said to be a deadly sin so you had better keep smiling and enjoy life," concludes his story Vladislav Bukreev. Artificial intelligence software attempting to unpick mysterious taunting codes left by the infamous Zodiac killer has started doing something quite disturbing. The robot, known as CARMEL, is trying to crack one of the most unbreakable ciphers in history. But what it's started doing is frankly scary - it has started penning weird, dark poetry. Using abstract symbols, code and ciphers sent by the brutal serial killer to taunt local media and police, the software is now creating complex verse. One of those reads: "Surrounded by the troubled, by the thieving, Confused and bruised and poisoned by the master, Confused and blinded by the helpless scheming, Confused and blinded by the dreadful slander..."
The Zodiac killer was active during the 1960s in North California and claimed to be responsible for the murders of up to 37 people. He wrote to newspapers and mocked local police - who have investigated more than 2,500 suspects and to this day are stumped. Despite the best efforts of technology whizzes, no-one has managed to crack the codes. It is one of the greatest unsolved serial killing sprees of all time. Forensic technology at the time wasn't advanced enough to track the warped murderer down - but now there are high hopes the artificial intelligence could blow the five-decade-old case wide open. One cipher in particular, known as the Z340, has baffled the greatest minds in cryptology for nearly 50 years - and it continues to draw scrutiny because the Zodiac killer claimed this code contained his real name. The robot now attempting to unravel the mystery has been created by AI and linguistics expert Keven Knight, reports the Indy 100. He fed CARMEL all the information currently available about the killer, including details of the alleged murders. Part of its programming allows it to create verse. Another reads: "Through the taxi and prison break, Alone and angry at a brutal murder, Surrounded by an artificial lake, Never a convicted murderer." While officially connected to five murders and two attempted murders, the Zodiac hinted he had killed at least 37 victims. After taunting the police and the public with nearly two dozen letters, Zodiac seemed to vanish in the late 1970s. A 'time traveller' claims to have created a time machine which can move the user forward through time using electricity and water. 'David', from Slovenia, says he left his family for eight years to find out more about time travelling. On his long travels he met a man called 'Jack Lion Cousteau' who built a time machine and had pictures to prove it - although he didn't allow David to bring them back to 2018. David, who says he studied physics from childhood and likes Nikola Tesla, used this knowledge to create his own machine. He says 'nobody will believe' his amazing story. Speaking to ApexTV he says: "I dreamed about making it (the time machine). "Eight years I left everything, even my family, to make the machine, it was my dream. "During that investigation I have passed through (the) whole world. "I tried to find an example of the time machine or find the person who could know even a little behind it. "I met person who had a wound on the head from a laser weapon. Another person show me a photo from the 35th century. "In France I even met a person who had made a time machine, which worked by the help of electricity and water. "His name is Jack Lion Cousteau, this happened in '28. "One could travel in the future or in the past. "Jack had been even in 5th century. I found out that travelling can hurt very much because the machine work by the help of the electric energy. "It passed through the wall barrier and could leave serious damage." David says he has been the 45th century and buildings there have more than 500 floors and 'flying machines'. He has 'travelled' 20 times using his own machine but can only travel to the future. This, of course, raises the question, how did he get back to 2018 if the machine can only transport him forward in time?